Whilst the use of illustrated reportage in fashion has been around far longer than many other forms of coverage, the standard method before photography in fact, it is the increased urgency and desire for immediate content in recent years that has led to websites looking for new paths to draw viewers to their site, away from the Vogue and Style.com slideshows. Backstage photography, live feed video, instagramming, panel discussions and sketches from the shows, all are now a regular part of the continued frenzy that dominates the fashion week calendar. Tara Dougans, Giambatista Valli Couture, for Showstudio. 2013. When commissioning illustrators for this, there are usually two paths to the content. There are the series of works that are commissioned to co-inside with a full article or round up of the shows, perhaps created within the space of two or three weeks. The illustrator is given time to produce fully flourished works in their normal capacity. 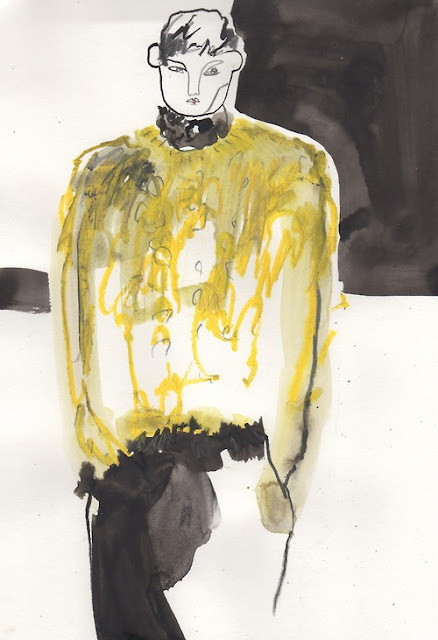 Then there is the burgeoning new focus on immediacy, illustrations that are uploaded within a matter of minutes of the look coming down the runway. The nature of these works are deliberately sketch-like, keen to imply the impressions gathered, some drawn direct on an ipad, some at the shows themselves. This urgency relies on the illustrator of course to have the ability to sketch an outfit as fast as possible. Gesture, presence of hand and an instinctive ability to capture proportion and anatomy are paramount. Again, hardly a new concept, it's a lesson in skills and observation that any artist or student will have undertaken at some point, whether or not it is relevant to their own style. 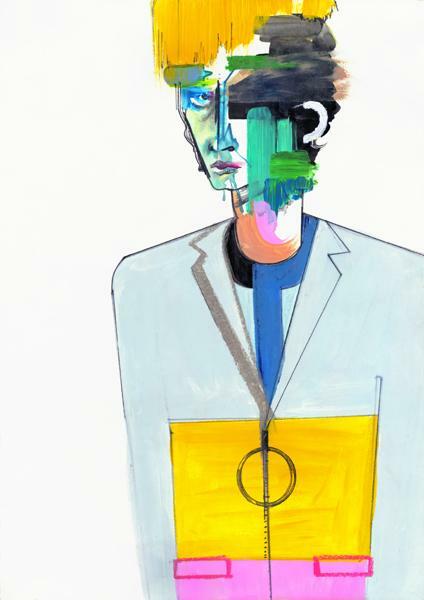 Richard Haines. 'Luigi in A.A'. October 2011. 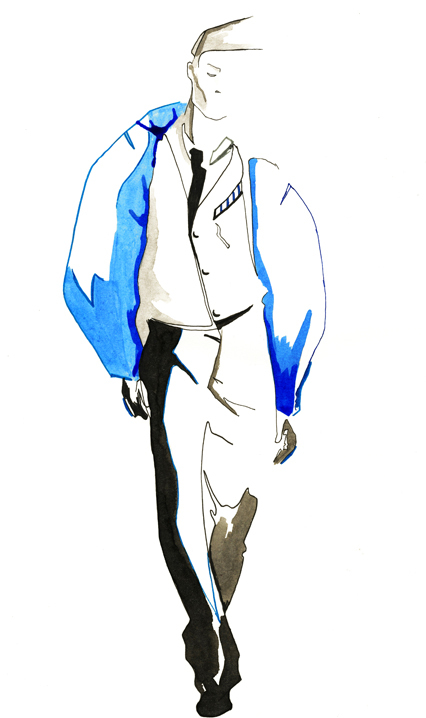 "How does illustration fit into the fashion zeitgeist today? It has to be quick and expressive, like scratching a note. 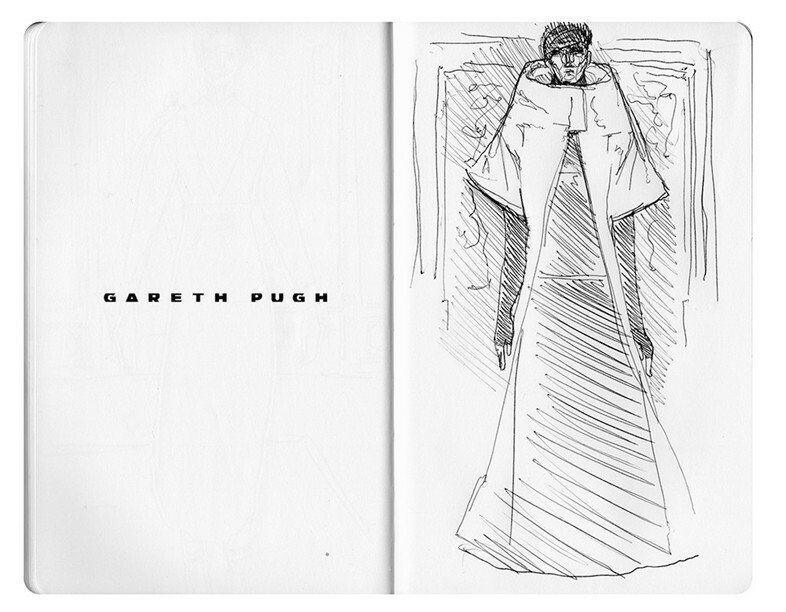 Which Grace Coddington does, known for the volumes of sketchbooks she gets through during fashion month." While this is of course true, and it is indeed important for many illustrators to be able to capture a certain something, be it movement, the billowing of a fabric or a suggestion of the environment, is it certainly not the ONLY way that fashion incorporates illustration, a notion that I can imagine many hard working illustrators ( and artists in their own rights) would take offence to, myself included. 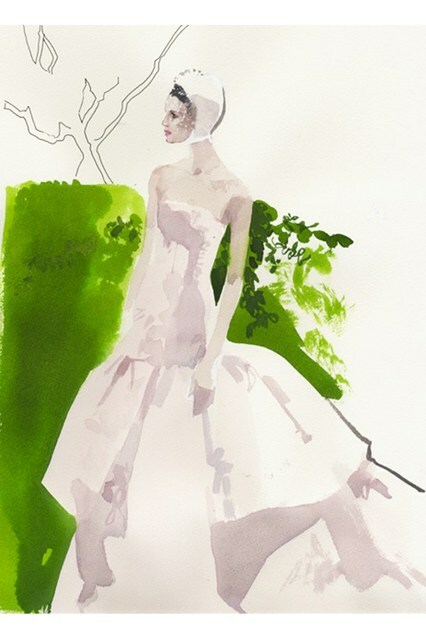 David Downton, Dior Couture look for Vogue.co.uk. 2013. This increasing trend for new material to retweet, retumble and reblog poses a risk however. The nature of social media is a continuous feed, whereby information is quickly replaced by more information in an almost Orwell-ian fashion. There is a potential loss of artistic integrity when one is at risk of sacrificing their style to achieve this by cutting corners, digitally using the same head in every work in a copy & paste manner and losing any form of expressiveness. (of course, not many illustrators are doing this, and I won't name who does). My issue is that there simply needs a clear defining that this is indeed sketching, and reportage. It is illustration at it's most primary and at times, most effective and occasionally brilliant, and sometimes downright terrible. The brief to produce instant reportage within an hour or two, or that it has to be quick and expressive, is just simply not a representation of fashion illustration as a whole, like Dazed suggests. Julie Verhoeven, Jil Sander SS09, for Ponystep.com, 2008. "When I was first asked to draw at the Couture shows for the Independent it was a really interesting time. The first couple of seasons were in the early 90�s so I saw Couture shows designed by Gianni Versace, the last shows of Hubert de Givenchy, Gianfranco Ferre designing for Christian Dior, amongst the others: YSL, Chanel, Lacroix, Valentino, and then was lucky enough to go to John Galliano�s first and second shows for Givenchy and was working with Alexander McQueen for his first Givenchy show. All the big supermodels were still working the catwalk, but there was this big change happening of these Couture Houses being passed onto new English designers. At that time there was no internet access, and no photography, so you had to quickly sketch every outfit that came down the catwalk in case the editor decided she wanted you to draw it, because there was no other way of getting reference. The first ever Couture show I went to was Versace, where for this show, every item, skirt, coat, top, bag shoes, gloves was in a different and very specific print and texture. Several prints per outfit. And all the way through the shows, two models were always sent down the catwalk at once. The roughs would be drawn in the hotel room in Paris that evening, after the shows, and the artwork completed by the time I returned to London. All on a tiny little hotel table and table light, stretching the paper in the bathroom, drying it with the hairdryer, and painting into the early hours of the morning. " Richard Gray - Decoy Issue 3. Matthew Attard Navarro. Balenciaga, for Dazed Digital. 2013. Of course, the nature of Richard's work only required the immediacy of sketching and getting details down, not the immediacy of output. Fully rendered works were created from these sketches. David Downton is also fond to mention his first experience of drawing from the shows, (Versace also), whereby he had managed to draw one arm before the model, Kate Moss, had already disappeared again. 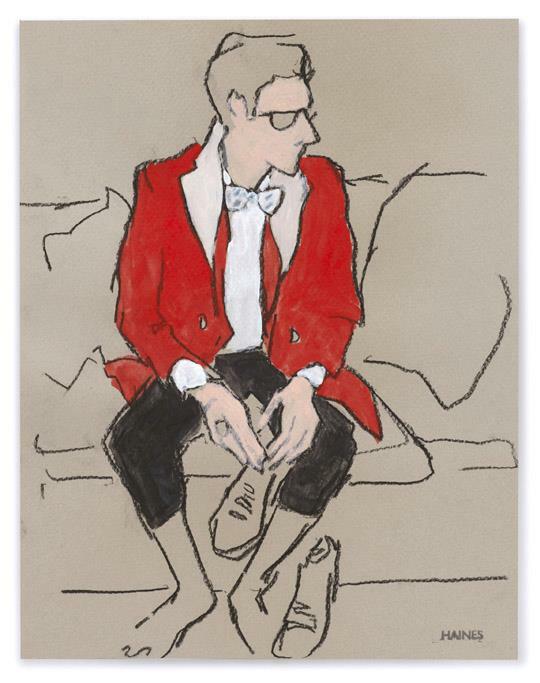 American illustrator Richard Haines is a great example of how reportage illustration can be done brilliantly. Famed for the drawings on his blog What I Saw Today, his talent relies on his innate ability to capture bodily proportion and gesture so well, whilst retaining a sense of flare. 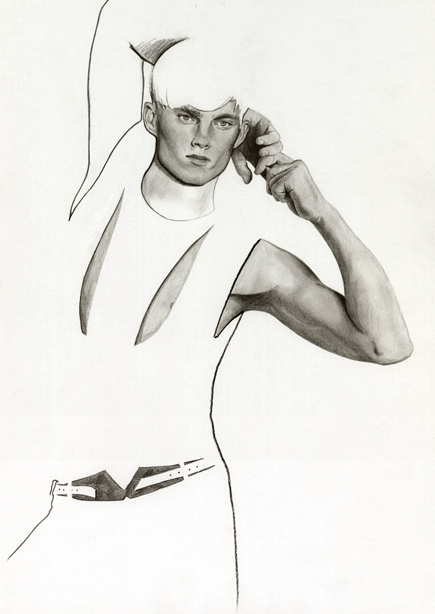 Richard Kilroy, Thierry Mugler SS13, for Homme Style, 2012. Hellen Bullock, Gucci AW13, for Showstudio. 2013. I've included in this post a selection of my personal favourites from various reports, both a mix of instant and non-instant works, illustrators established and emerging. While I'm not one to admit whom I'm not personally a fan of, each to their own after all, I'm not convinced that ipad reports using the same head in every illustration, or styles where the talent has been compromised in order to dish out the looks quickly to suit the client's social media, are the best way to promote the placement of fashion illustration in an industry that already struggles to place it comfortably, in the era of photography and digital immediacy. I will say this though, this immediacy aspect is of course a fantastic idea, allowing artists to both explore their style and timing abilities, whilst incorporating an illustrative element that will spark the interest of many. It just may not necessarily be suited to every illustrator's technique. Richard Kilroy, Raf Simons AW09, for Ponystep.com, 2009.